There is loads of good stuff in this post; many thanks for putting this together. I'm sure a Dry Stout would work well here instead of Ale? I reckon there's about 70% hydration here and I just wonder if you dare go a notch higher; 75? 78%?? I like the honey and molasses; I've always combined malt and molasses, but you are making this more complex by using ale. I appreciate your kind words and comments on this. I'm certain a Dry Stout would be perfect. I used what I had on hand in this case. You know I hate to admit it but the hydration is an unknown to me. My adjustment at the end with the rye flour has made it hard to determine for sure. I'll pay more attention next time. I figured there are so many variables with the scalding and the grind of the chops and meal it would be hard to make it meaningful in a recipe. There is a good bit of malt in the nut brown ale. All of these deep organic flavors seem to go well here. I'm working on a small batch that will use Sorghum with the Black Strap. I don't know if you have that product in the UK but it is a very specific deep and rich flavor that will change the flavor complexity. I really appreciate all your advice ofer the years on this Andy. You have been a big help. That looks very impressive, and intense. Would love to try a slice. Thanks gvz, give it a try. It's almost exactly 2 years since I first joined TFL community. The time has been instrumetal for me in developing my baking, and I'm happy to have helped anyone along the way. Yes, we can get sorghum, I believe. However, I haven't used it. That is such a beautiful pumpernickel, Eric! I would love a closer view of the crumb. Just so I can drool all over it. I got some lachs paste here... Fresh from IKEA, they would go well together. :) Or maybe just eat alternately with a crisp juicy apple. Mmmmm. Oh, so that's what it is, lol. You are right this flavor is a special treat. An Apple does sound good. Did you ever look at the ingredient list for spices? Still curious about that. Thanks for your kind words oh Master. A thousand apologies for omitting your name above in my list of helpers. You were the original inspiration in Rye. but you know I wasn't thinking about such things. I was in a store with a wide range of pumpernickel and vollkorn breads just reading and trying to find cinnamon that hasn't been cut with sugar! That should be the new Christmas scandal, and all the package says is ground cinnamon. Start comparing to stick cinnamon and try to figure why ground costs less per gram? A scandal!!! I appreciate you looking. My father in Michigan looked last week in a large well stocked grocery and found a similar situation. There were 4 varieties, each with a different assortment of seeds. All baked in the German bakery in Chicago. I haven't added any sunflower or pumpkin seeds yet but it won't be long. just sunflower or just pumpkin doesn't taste as good as sunflower & pumpkin together. Munch on some and tell me what you think. That sounds like it makes sense. I'll give it a try. I'm still struggling with a tough crust. 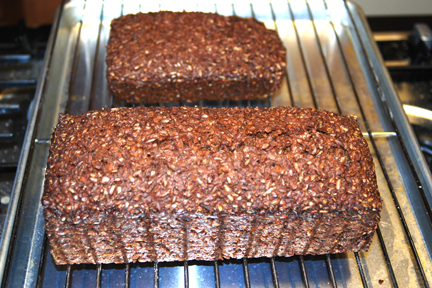 My dark breads are delicious but are difficult to slice a thin piece off. 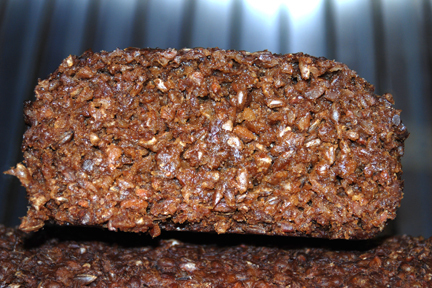 The outer crust gets pretty hard once cooled and aged a day or two. Any suggestions? I'm thinking It must be the initial high heat? Mini-O do you have any Indian (South Asian) groceries in your area? I get my cinnamon (and many other spices) from bulk bins at an Indian store. A busy place, with great turnover, the spices are always very fragrant, and certainly not cut with sugar. A treat when I was working in Sri Lanka was visiting a cinnamon 'farm'. I'm just watching Rick Stein's 'Christmas Odyssey' and in it there are scenes at a cinnamon 'farm' in Sri Lanka. Found it on YouTube, see 7'37". Got one two klicks away. Their turnover is rather slow but they so have the spices! This bread says big time flavour to me from looking at your formula, process, and photos of it. Using a faux barm may not be in the tradition of Vollkornbrot or Schrotbrot, but I'd be very surprised if a German baker or two hadn't used one of their own dark beers for something similar, since it seems like such an organic combination. Good choice to give this bread the low and slow bake to meld all the flavour components thoroughly, in addition to creating new flavours that you might not have had in a standard bake profile. I wonder if you saved a heel of this to use as an altus in the next mix, if it might bring something worthwhile to the party. It couldn't hurt at any rate. Delicious looking bread Eric and a clear example that thinking outside the box sometimes can be very rewarding. I always enjoy your comments when I stick my neck out. Thank for your kind words. If I can manage to save a chunk for altus, I'm sure it would add something to the party. At the moment I'm so excited at nailing down the baking and starting to get a handle on flavor, well I'm surprised honestly. Thanks again pal, I appreciate it. That looks like it packs a punch Eric. The crumb colour is intense. Like very grain is caramelised within it. The 10 hour bake time amazes me ... Can only imagine how this translates into the flavour profile. How is the crust? It definitely packs a flavor punch. The crust was soft when it came out of the pan and has firmed up some as it has sat wrapped in plastic wrap for 24 hours. The Maillard reaction of caramelizing the sugars works on every particle. That looks like a winner, Eric, traditional or not. And it will make a very good base for all kinds of toppings, I think. Any notion of how much of the color derives from the molasses and how much from the extended bake? Thanks Paul for your encouraging comments on this. This bread has a base flavor that will pair very well with any smoked fish or meat. I would like to find some party loaf pans to bake it in a cocktail bread size. No luck sourcing yet. The bread darkens considerably in baking. The grains are caramelized by the Maillard effect. It isn't truly black but quite dark brown. The ale I used being dark also plus the dark rye also contribute to the paste color. Great post and beautiful loaves, Eric! 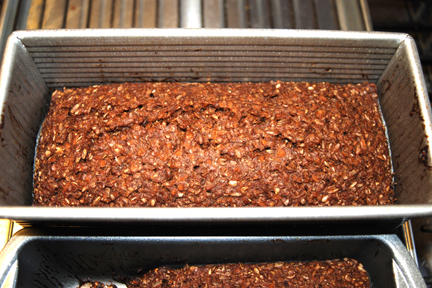 I have loved the idea of overnight-baked rye since the first time I heard it. Now that winter is here I may finally get around to attempting it. It seems (from what I've read, anyway) that using little or no flour really increases the odds of success with this method. Thanks for sharing all of the details. It's easy to come to the conclusion that these are easy to bake since there really isn't any dough handling. Just start early for the sour and soakers and mix with a spoon. But what I am learning is that the hydration needs to be right or it will be so gummy or crumbly it becomes hard to slice. Give it a try. The flavor is addicting. Ah, thank you for the warning. I'll be coming back to this one. So that is what it should look like! Gorgeous, Eric! Inspiring too. So far my own 100% rye experiments have resulted in masonry materials. I baked a Russian Black Brick just a couple of weeks ago. It had great rye flavor, and great masonry texture. Do you do the 10 hour bake overnight to keep yourself from peeking, or during the day so you don't sleep with a live oven going? Thanks for your comments. Good looking masonry products are hard to find. Lol. I bake these long projects over night with complete confidence in my old oven. I wouldn't leave a very hot oven alone but at 240F I trust it. Same thing with the smoker outside. but still an authentic delight. I can imagine the bitter-sweet-sour taste of my beloved brick! I don't believe that your bread is disrespectful of your forefathers, after all you only added small amounts of honey and molasses. They used whatever they had available, didn't they? I just wonder how much sweetness and color you would have obtained after 10 hours of baking, a lot in my opinion. I'm glad to see you comment on this nico. It is a very nice tasting loaf but I want to ask your opinion on the crumb. In the center of the crumb, it seems to be tending to be gummy, like it was under baked. But at 10 hours, how could that be? I find this to be very hard to slice. Frequently the center of the crumb is so soft it sticks to the knife and pulls chunks from the loaf. I must have had the hydration to high is all I can deduce. I didn't pay close attention to the exact hydration since the amounts and types of rye products all have different absorption qualities. I adjust by feel. it's the fine flour, Eric! I learned the hard way that the only sane flour to use when baking for so many hours is ... no flour! Or at least not fine flour. You can see with your eyes up to what extent amylase literally melts down the flour after so many hours of baking. The finer the flour the more it gelatinizes and the more amylase turns it into sticky and wet maltodextrins. I had a correct crumb only when I used exclusively soaked chops and very gross flour to keep them all together, very much like the sawdust that Andy showed us long time ago. Remember the pumpernickel video on youtube that showed how the bread is prepared and baked in the industry in steamed rooms? The grains were grossly ground, mixed with old bread and water until a very thick stuff came out in logs and was transferred by hand in baking pans by workers (carrying them in shoulders! just to give an indication of how stiff that stuff is). Moreover, in all rye schrotbrots I see in shops there's never the reading "rye flour", but simply "rye, water, rye sourdough, salt". I guess this says everything there is to know anout this mysterious kind of bread: no flour! The only problem is guessing the fineness of the chops: too big and the bread will crumble when sliced. Since I began to ferment the whole dough for at least 24 hours I didn't have crumblling problems anymore. I am thinking you hit the issue on the head. Thank you. The frisian recipe you linked to speaks of fermenting but not the use of leavan. Is that what you are doing with this? Just to be clear you are fermenting with a rye leavan for 24 hours at room temperature? Do I understand this correctly? The dough would ferment without the addition of a leavan also. As I read the procedure that would be the sweet version. Yes, Eric. In the past I followed 2 different paths: either I added some rye starter to the dough and let it ferment for 24 hours, or I used only the raw ingredients (without starter) and let the dough rest until it began to acidify spontaneusly (notice, regardless of the presence of 2% salt!) until the dough reached a pH of 4.0 (generally the third day). Notice that in the Hyfoma recipe there's lactic acid added as a shortcut, as a replacement for sourdough. After all a bread like this needs some starter only to acidify the dough, not to raise it (it can't raise). More. Regardless of the acidity of the dough the bread always came out remarkably sweet, smelling and tasting of malt, so evidently the mild acidity of the dough (4.0 isn't that much acidic, even though it takes a lot to reach it) relents the action of amylase, but it doesn't completely stop it. The issue with gumminess in wheat based bakery goods ia a recurring problem that I still have to overcome. Thank you nico. I appreciate the clarification. I will try again using only rye meal (the finest rough grind I have), and rye chops. I will use the leavan for souring. What a wonderful series. I was hooked immediately and watched all the way through the series. I now have a few great recipe ideas for my left over turkey. Thanks for pointing that out Robyn. Glad you enjoyed it. 'Traveling' with Rick Stein is great.....not just the food, most places I've been myself and love seeing them again. I know the episodes can be found on YouTube before we finally get them but I always wait for them to be broadcast here. The most recent series was titled 'Rick Stein's Spain' and was on here recently, highly recommended. Other series titles include Far Eastern Odyssey (footage from which was used in the the Christmas programme), Mediterrean Escapes, French Odyssey, Food Heroes, Seafood. Thank you Robyn. I have seen one of these a while back but hadn't seen the collection until you directed me. He is a very interesting fellow and I like the way he investigates the area. I was a pilot for 30 some years but I'm not as well traveled as my son who is a musician on a cruise line. He has been all over the world looking for the local treasures over the lunch or dinner hour while off the ship. Rick Stein brings back a few memories for me. The best to you too Robyn. Hope you have a great holiday.